This page has been galloped through times. Colour: Dark bay with a big star. We began preparing late so I didn't get the time to give her an extra work so I came to the show fully expecting to have an incredibly excited horse on my hands. Well, I'm now on the cover of foot-in-mouth magazine. She was a perfect lady. The footing was REALLY deep so she really had to work to get her feet out of the muck and over the fences. Holly was being very honest. We all know she has a thing about in-and-outs, but thankfully she trusted me and we got through alright. Our neighbors have a better ring (ours is serviceable, but not as good) and we'll be going down there a few days a week in the next two weeks before the next show and work some more on getting her relaxed with them. She should be absolutely fine before the next show two weeks from today. Considering it was our first real show and all other outside influences (heat, HUGE thunderstorms, etc...) we did really well. Everybody was a bit rusty. The judge was really odd, which unfortunately is typical in this area. Poor Holly was SO tired! Everybody made fun of her weight, as usual. After not seeing her all winter their eyes need to adjust to her galaxy sized barrel. However, hopefully they won't have to adjust too much because we are putting her on an "official" diet. None of this "we'll try to peal her down" stuff, she NEEDS to lose the weight. The picture of her on this web page was of her in 1997. Add 75 pounds to that and you might get the jist of what she looks like now. Yikes. Our next show is this coming weekend (June 13) and this is a full show so it will have the Low Working Hunter and Special Hunter Horse divisions that we usually show in. YAY! I would like to thank my Mother and Trainer who has been training me from the beginning of time, and putting up with me for all that time, and I hope she will do the same for a while longer. I also have to thank her for finding Holly, the poor cast-away who needed someone to listen to what she had to say. Of course, I thank Holly for putting her heart into it and behaving herself when it mattered. I need to thank my Grandmother, whom without which, I would have never been able to afford to go to all the shows. SHE made this summer happen. I thank the rest of my family for supporting me. My friend and riding buddy who rode with me all summer long. My old pony, Promise who showed me the ropes of riding a horse instead of a pony without being TOO far from the ground. (14 hhs) Without her, learning to ride Holly would have been a far FAR **FAR** greater challenge. I could go on forever. Thank you! Low Hunter and the Pleasures weren't offered at this show. :-( In the morning I woke up at 5:20 a.m. to a HUGE thunderstorm, but my friend and I decided to rough it anyway. Good thing too. We got up their and the sky was cloudy, but not a drop of rain. Holly was feeling good. Alot better from two weeks ago. We had a good warm-up and a good first round. Coming around after a diagonal in the middle of the second class, we took down a rail and she bucked, put her head down, and dragged me out of the saddle onto her neck for about 5 strides. And there I rode around the corner one foot in front of the saddle. Just in time I pulled myself back up, (From a near fall. It's hard to ride a horse with it's nose in the dirt.) and finished the course with flying colors. Never gotten such big applause in my life. There, my day's brush with death. (Well, not really, but hey.) She went great in the flat class. Then we had a few missed distances in the Final. Though year end points are not completely calculated yet, it's looking like I ended up pretty high in the standards. We all have to have a few of *those* days. Holly started out "higher than a kite" if you pardon the expression. She was rather spirited. In her antics both in and out of the ring she must have strained something because after Specials we had a long break and then she was sore in her right shoulder during Lows. She seemed okay for the first round, but then it got worse, so we took her out of the pleasures. :-( Today we did mostly walking and she seemed alot better but we can't be sure yet. This really couldn't have happened at a worse time. We're just finishing up the year so she's still working hard and the competition in the pleasure classes is intense. People scrambling for year end points. The weekend after this coming weekend are the Hunter Finals. I really hope she is better by then and not just to get the points and awards. Oh My Goodness Gracious!!!!!!!!!!! WE ABSOLUTELY *****CLEANED***** UP!!!!!!!! HOLLY WAS FABULOUS!!! MY GOD WE COULD HAVE SOLD FOR A PRETTY PENNY IF I HADN'T BEEN SO INSISTANT ON KEEPING HER. Alright. Here is the outcome. It must have figured that the date of the final day of the show, one year ago, I bought Holly for, pretty much, pennies. This is by far the best showing we've ever had. My eye for distances to the fences appeared at the previous show and everything else fell into place. This is my favorite show of the year. (It almost always has been.) The footing was good. Courses great. The people running it were polite and happy. Holly had just the right amount of energy and I wasn't sleeping at the wheel. Special Hunter Horse- 1st and two 6ths. We had a pretty good show. Holly has been a little sore through the shoulder so we decided not to put her in the Low Hunters which is three feet. We had nice rounds in Specials and won the flat class. That was good. In the pleasure, I suspect the judge wanted their heads a little farther out. Though I don't know why, but she pinned a nice horse with his nose out. Holly is well framed that she wasn't the judge's style. All in all, it was a pretty good show. Special Hunter Horse Division- one 1st, and two 6ths. Low Hunter Division- one 2nd, one 5th, one 6th. In the Specials she was feeling fresh and she bucked a little bit, but we got the flat class. In Lows she was tired and the distances were big so we had to move on, but I couldn't quite get the pace I needed. She was behaved in the Pleasure class, and went even better in the Hunter Hack. Special Hunter Horse Division- one 1st one 4th and one 6th. out	of who knows how many.... Alot. Low Working Hunter Division- one 1st. We were doing okay in Specials, but she touched a few fences and I buried her at a fence so that is why I got the lower ribbons int he over fences. In Lows, I sort of fell apart. The courses were REALLY hard so I went off course. I knew the course, but I fell asleep at the wheel. In the second over fences class she refused one fence. She didn't see it really well. It came off a hard turn and I wasn't there to support her. In the flat classes in both divisions she did very well. She showed off. Same in the Pleasure and Hack classes. The judge really liked her on the flat. Lupus Benefit Horse Show ; Special Hunter Horse Division: One 1st, one 5th, and one 6th. Low Working Hunter Division: One 1st, one 5th. Maiden Equitation Over Fences: 1st. Holly was very well mannered, even when she was feeling a bit high strung. I can't wait for the next show. She is doing SO well. Side Note- Holly did show better in the pleasures than what she received. We have had previous experience with that judge and he is not to our liking. She probably would have placed better with another judge. Here's a tip to all nervous, or wiggley riders. Sing. Pick a song with a great beat and a catchy tune and SING! It really calms you down. You sound rediculous, but if it works than whats the problem? Would you rather have a rep of a sane but timid rider or a slight bit crazy and go for the gusto win everything rider? My first show is May 31. I will be showing in Special Hunter Horse which is 2'6" Hunter Pleasure Horse and Hunter Hack Horse. I'm skipping the Low Hunters just for this one. It's 3' and we're not polished at that height yet. It probably will also not have any effect on the end of the year out come. It's a small division. Would you like me to explain what the classes are? I will anyway. hehe. 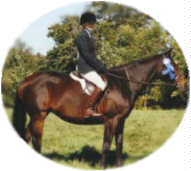 Special Hunter Horse is a division of 3 classes. 2 over fences and 1 on the flat. The jumps are 2'6". Hunter Pleasure Horse is a flat class that is judged on Holly's manners and how pleasurable she is. Hunter Hack Horse is the same thing except you jump a line of 2'-2'6" verticles. Holly is an excellent pleasure horse. I have high hopes for her in those two classes. In Specials the compition is immense. All the hot shots are in those classes. I jumped Holly for the first time in 6 months on Tuesday. Wednesday was her birthday so I gave her the day off. Thursday we did ring work and I fell off. She darted out the gate and bucked. We were practicing with out stirrups and that is what got me off. If I had had my stirrups I would have stayed on. On Friday we went out on a trail ride in the evening. It was so much fun. It was getting nice and cool and the sun was just above the mountains. Today, we did more ring work and I jumped her again. Our first times were horrible, then we began cantering them, the fences got higher and we did much much better. I'm so excited about our first show at the end of May!! I probably won't be going in Junior Limit because the fences are only 2'3" and Holly almost trips over them. She takes down rails and drags her hind end. She is so neat and tight with both ends when she's jumping solid fences. It's amazing the difference between 2'3" and 2'6" because the Hunter Horse divisions have brush boxes, roll tops, etc. 2'3" is just verticals and small oxers. No flowers, no brush boxes, no roll tops, no hay bales, no nothing. Pretty boring if you ask Holly and I.
I'm finally able to ride Holly almost every day now. It is really hard to ride in the winter. The roads are icy, and we have no indoor. She is progressing quickly. I've heard that she is hard to start up after the winter, but I'm not having any trouble. We put the German Martingale on her yesterday and she was really responsive to it. It is not allowed in the show ring, but all she really needs is just a few weeks in it to get her seasoned again. I am also beginning to trust her more. I don't have to worry about her spooking at a garbage can or something. She was really skittish when I first got her, but she has become a lot braver this spring.